Truth in advertising is as rare a thing as it gets. But just an initial look at Super Showdown’s main event seems to confirm that while indeed rare it’s true of this coming card from Scotland. The United Kingdom and the nations around it remains a fertile and active proving ground for Muay Thai. 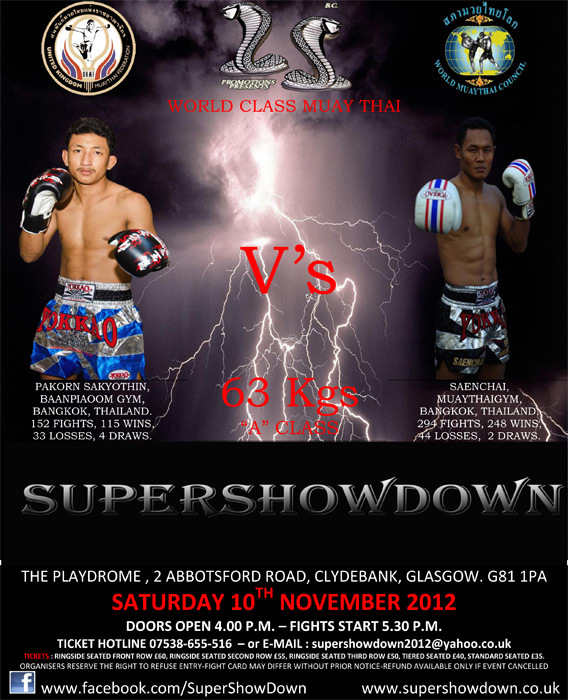 The main event features none other than Saenchai, the widely acknowledged pound for pound best of Muay Thai. Saenchai gained his reputation in the stadiums of Thailand fighting and beating opponents and often giving the weight difference and still getting the wins. Saenchai now fighting more internationally is continuing to cement his reputation with solid wins and a recent KO of Chinese opponent, Chao Li Dao via elbow strike. Pakorn Sakyothin is a different story. Pakorn gained contendership status in the stadiums of Thailand by fighting and beating the very highly regarded Pornsaneh Sitmonchai back in 2010. Pakorn as of August was ranked number in Rajadamnern stadium at 130 lbs. weight limit of lightweight as of August 2012. Pakorn brings a compact and conservative style backed by his incredible toughness. His game is less a fast break game than Saenchai and instead he prefers sharp counters. No title from any independent sanction is on the line nor is it really needed. Yes that is a truly world class main event. Promoters’ should really take note from this main event. Meaningful fights sometimes have a lot more to do with who’s fighting than the piece of jewelry on the line. Yokkao Promotions released a bit of the spoiler of the main event by releasing the above photo of the contract signing between Saenchai and Pakorn. So, spoiler aside it’s confirmed Super Showdown is bringing as exciting and well matched of a main event any Muay Thai card could possible hope for. The supporting card has some UK titles up for grabs as well with a solid looking card. Event and ticket information is available on the official Super Showdown site.